A simple summer appetizer: blackberries + mascarpone cheese with thyme and lemon zest. (vegan option). Now that it’s nearly summer, I’ve been making more and more things with less and less ingredients. 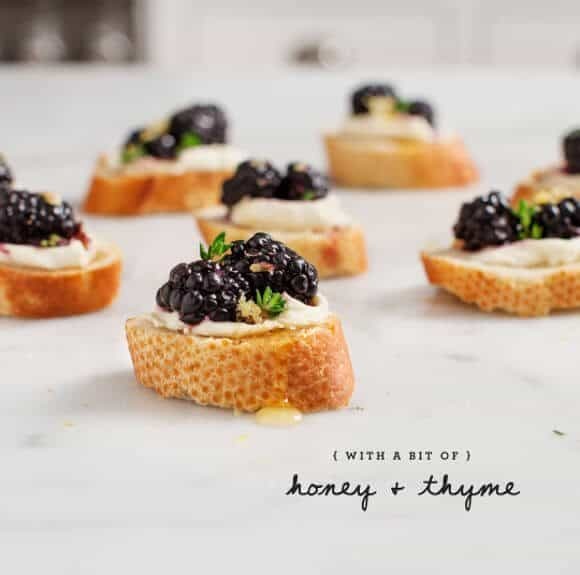 Lately, I’ve been in love with this juicy little blackberry bite – it’s simple, sweet & bright, with an unexpected savory note from the thyme leaves. These would be beautiful (not to mention ridiculously easy to assemble) for any last minute cocktail party. The only thing missing here: a patio & a few glasses of prosecco. It’s 5 o’ clock somewhere right? Place blackberries in a small bowl, add a pinch (or two) of sugar and a small pinch of salt. Stir, and let sit at room temp for 20-30 minutes. (you can skip this step, it just makes them a bit juicier). 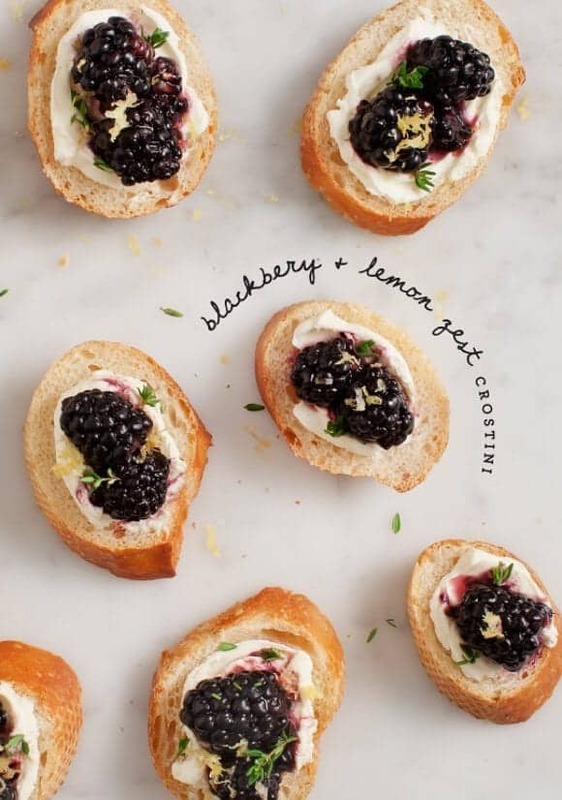 Assemble crostini with a spread of mascarpone cheese, a few blackberries, top with lemon zest. gluten free version: use toasted gluten free bread or crackers. vegan version: make cashew "cream": 1.5 cups soaked raw cashews, drain and rinse, then blend (in a high speed blender) with the juice of 1 small lemon, ½ cup water (more as needed), and a few pinches of salt. Blend until creamy, then chill before serving. (Also - skip the honey on top). These are so beautiful. 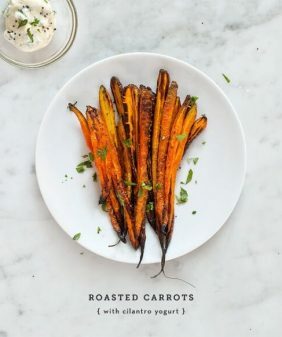 As soon as I saw them I thought they would be lovely for a little backyard dinner party, and then there you were suggesting it. Now I just need more patio furniture and I’ll be all set! Love the vegan version, so pretty!! These look so nice, such a clever idea! Wow elegant! I’ve never tried a sweet crostini but I think I will have to now. Sounds like it would be lovely with fresh blackberries! That looks so delicious! A perfect summer recipe and very original too! ha, well we don’t have them growing wildly here either (opposite problem – we have extreme heat – I think berries grow here only for a very short time). They’re pricey but oh so worth it every now and then! 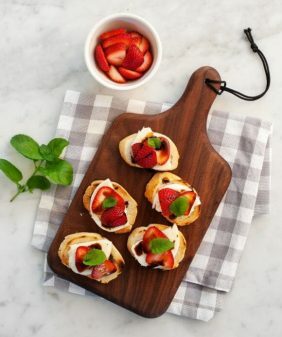 Ahh yes the summer time is when I go simple in the kitchen too, and now you have me craving prosecco 🙂 Beautiful pictures by the way! I love the simplicity. As I am constantly traveling and rebuilding kitchens, I am always on the hunt for quick recipes that will yield amazing results with few ingredients. If it winter wasn’t turning the corner here in Santiago, Chile, I would definitely be making these for fellow travelers. I love this idea! And they look stunning. 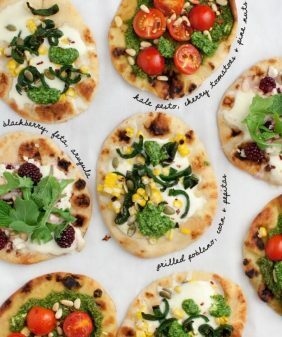 These sound wonderful; I love the combination of creamy cheese and the bright and tart fruit. What a sophisticated little mouthful! Does this count as an appetizer or dessert? I love the combination of blackberries and goat cheese – but I have never tried marscapone. What a perfect appetizer for summer!! Yum! thanks! 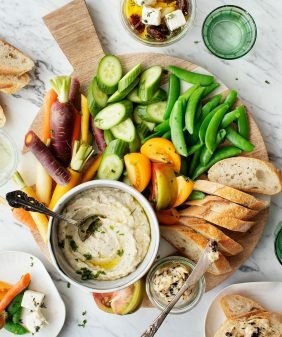 It’s mild like cream cheese (I like it because it’s creamier and easier to spread) – although for a bolder flavor you could use goat cheese. This is the best idea ever! I could see the blackberries being macerated with a little balsamic too for a more pronounced savory/sweet. Yum! These look so good and perfect summer appetizer! These look divine! 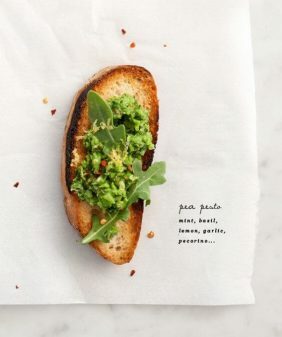 I love anything that it’s socially acceptable to eat with my hands, and these crostinis are just too cute. I’ve never made cashew cream before, but I’ll definitely have to give it a shot, maybe even with a little agave nectar drizzled overtop. Perfect for this time of year. Different. Easy. Happy face makers. 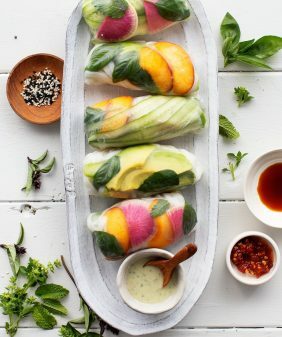 These look absolutely amazing and so simple! I can’t wait to whip these up this weekend. YUM!! I love crostinis, seriously they are a perfect food and if i were to ever open a resto it would be one dedicated entirely to crostinis. and tequila. this version looks bomb. roberta’s in brooklyn has a version that’s smoked ricotta, fresh thyme, honey and cracked black pepper that is just so perfect. I love your photos, they are gorgeous! !